FaxBack and AudioCodes Expands Fax Machine Connectivity to VoIP and Fax Service Providers, Business Fax Servers and Enterprise VoIP Solutions. The new AudioCodes MediaPack™ MP-202B HTTPS Enabled Fax ATA supports HTTPS fax connections that allow fax machines and multi-function printers (MFP's) to easily integrate with fax servers and enterprise VoIP solutions or connect directly over the Internet to VoIP providers and Internet Fax services - all done reliably and securely over the Internet including using satelite, cellular data and Wi-Fi connections. Talk to a FaxBack sales representative about Fax Machine Connections and evaluation the solution in your business environment. 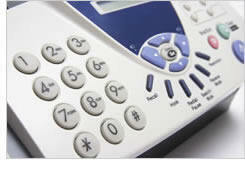 FaxBack and AudioCodes are expanding the ability of fax machines to connect to a variety of fax service provider; VoIP telephony provider; business fax server; and premise-based VoIP solutions - using the new AudioCodes MP-202B HTTPS Enabled Fax ATA with FaxBack's connection software and complete fax solutions. The expanded connectivity provided by the AudioCodes HTTPS Enabled Fax ATA also makes it reliable for users to send faxes over satellite, cellular data and Wi-Fi networks. "Today, fax-to-email is an acceptable solution for receiving most faxes, but businesses will always require fax machines to send hard copy documents," said Quentin Dible, President of FaxBack. "Our combined solution with AudioCodes solves the issues of security and reliability with connecting fax machines over the open Internet; it allows users to connect their fax machine to their fax-to-email provider; and it allows businesses to merge fax machine traffic with their desktop faxing. Today, with the prevalence of business fax servers and fax service providers, the fax machine has been left out in the cold. Simply connecting the fax machine to VoIP hasn't solved the problem - it has merely reduced the reliability associated with faxing fax machines." 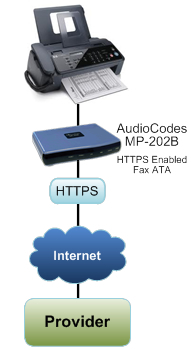 AudioCodes HTTPS Enabled Fax ATA differs from other Fax ATA devices in several ways: HTTPS provides more reliable connections to VoIP than T.38. The FaxBack HTTPS Fax Platform is not susceptible to burst packet loss and other issues associated with T.38 over the open Internet. HTTPS fax communication is encrypted from point to point, via SSL, which is critical for HIPAA and SOX regulated industries. And by using HTTPS ports, no additional firewall provisioning is needed, making installation easy and painless. Additionally, the user experience of the fax machine is fully preserved, including the ability to hear if an incorrect fax number was dialed, and a person answered the call instead of a fax device. AudioCodes' new HTTPS Fax Enabled ATA provides a wider range of network connection options for fax machines, including the open Internet, satellite, cellular data and Wi-Fi networks. Each of these paths requires a robust fax communication for reliability and security, and the new Fax ATA and connection solutions from FaxBack provide this functionality. Multi Function Printers (MFPs), which are currently a staple of today's business infrastructure, can now connect as easily as dedicated fax machines to over-the-Internet fax service providers. By creating the industry's most advanced Fax ATA and connection solutions, FaxBack, AudioCodes and their partners are allowing individuals and business to connect fax machines to their existing fax-to-email accounts that allow outbound SMTP based email-to-fax, also known as T.37 connections. FaxBack helps business customers increase the value of their fax server investments, by providing complete traffic management capabilities and by extending more features to the fax machine than were previously possible.